Search engines exist to answer the world’s questions and to get the most useful and relevant information into the hands of the searcher. Ideally, the most useful information is what appears at the top of the search results. Think about it: when you type a keyword or phrase into Google’s search bar, how often do you click a link on the second or third page of results? Or better yet, a link on the bottom half of the first page? Search engine optimization (SEO) is about getting your site to score as high as possible in search engine results rankings for particular keywords or phrases. Optimizing is really about communicating your value to search engines and helping them help you. Google’s search algorithm, in particular, is very user focused. To get your website and information in front of the people who are looking for things related to you, you can make changes to your content to support your discovery. If you’re not a tech wizard, SEO can seem intimidating. Luckily, experts, such as the consultants at Community Boost, are eager to help. A member of our partner program, Community Boost Consulting advises organizations they call “the game changers”–nonprofits and businesses driven to make a social impact. Among their other digital marketing services, Community Boost’s SEO strategies are specifically catered to help organizations scale their reach and drive the number of qualified visitors to their website. We sat down with Community Boost to discuss SEO best practices and how nonprofits should be thinking about optimization. Your organization can improve your online presence and ranking by optimizing your site in two different ways: onsite and offsite. Our list of tips includes practices for both types of optimization. Onsite SEO has to do with the content, product, and services that live on your site. Seventy-two percent of marketers around the world cited relevant content creation as the best optimization strategy when it comes to boosting their rankings. If a credible source links to your page via a backlink, it helps to boost your rankings and increase your exposure. This is considered an example of offsite SEO. Stellar content on your site is only half the battle. A proactive strategy to encourage backlinks to your site ultimately will connect your organization to a larger audience and ensure the work you put into generating valuable content does not go to waste. With this difference in mind, here’s a list of SEO tips for getting started that address both onsite and offsite optimization. To create quality content is to write or provide something of value to the reader. But it’s more than just writing something that they’re looking for. Other writers can do that too. You need to present information in a way that’s digestible and engaging, and in a way that resonates with the reader. The Internet has made it easier than ever to publish and share, but with that ease comes intense competition and saturation. It’s never been more important to produce content that is differentiated and focused. To focus your content, have a clear understanding of what your target audience is interested in. Rather than creating something and pushing it out at your readers, your content should consider what your readers define as valuable and be inspired by their perspective. According to Community Boost, individual stories and content pieces are more likely to resonate with readers than large newsletters with hundreds of components. Dial in on small snippets of specific information that will be sure to get your reader’s attention. Community Boost Pro Tip: While quality is more important than quantity, it is important to regularly produce quality content in order to develop your site’s rapport as a reliable, authoritative source. To boost your content’s SEO score, it can be helpful to write with a keyword in mind or to use keywords to inspire the subjects of your pieces. Selecting a keyword will help you communicate with search engines about the main focus of your piece, but remember that you’re ultimately writing for the reader. As you write, keep the keyword in mind, but don’t feel like you need to stuff it into your content in a way that is not organic. Google’s keyword tool makes selecting a well-informed keyword for your content fast and easy. Before using the tool, consider which terms and keywords you would like your organization to rank for. Use Google’s keyword planner to understand popular searches related to the terms you believe potential donors to be using. 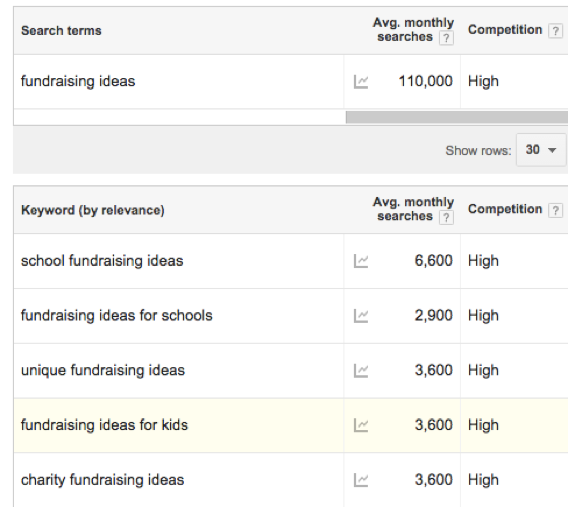 For example, in this search for, “fundraising ideas,” the keyword planner indicates the number of searches for different variants of that keyword. By checking the average monthly searches, and competition surrounding that keyword, you can make a more informed decision as a writer while drafting. The title and subheadings of your piece help structure your writing and align the reader’s expectations with your content. They also serve as a helpful cue to search engines. When keywords are used in headings, it shows search engines that the keywords are important within the greater context of the piece. The search engine uses this information to help determine if a page is relevant to a user’s search query. If you’re writing for a specific keyword, including it in a heading will help indicate it as a main subject. Write deliberate headings to not only organize your content well, but to also communicate the value of your piece to search engines. Hyperlinks within your text are a great way to cite information accredited to other sources in a way that is convenient for your reader. By including a link to another page, you provide the reader with more information and improve their overall experience. Hyperlinks generally appear as blue underlined text and indicate to your reader and to search engines exactly what the page you’re linking to is about. Anchor text is the name for the specific words linked to another page. Search engines assess anchor text to check if the content of the article matches what the link suggests the page will be about. This information is then used to better understand the relevancy of a page to a user’s search. Images often add value to a piece. Unfortunately, Google can’t interpret images on its own, according to Community Boost. To communicate the purpose of an image to search engines, provide alternative text for the image. This text appears to a user when they are unable to view the image, and lets search engines know what the image includes or represents. Community Boost Pro Tip: Optimize the file name of the image and the alternative text to improve your image’s rank in Google Images as well. Don’t forget about your keyword here. When appropriate, using keywords in the alternative text is another way to let Google know what your piece is about and boost the overall SEO power. Backlinks to your site are measured by Google’s system called Page Ranks and increase your credibility as a source. The more backlinks to your site from credible websites, the more credible your pages will seem in the eyes of a search engine. One way you can make sure you’re getting backlinks is to reach out whenever you’re featured in local news articles. Community Boost recommends keeping track of when your organization is featured in the news and to always ask for a link back to your site. Community Boost Pro Tip: When you ask for your link, communicate why it’s beneficial for that organization to link to you. Let them know that it’s helpful to their readers who want more information about the organization. Many nonprofit organizations serve local communities and as such should make sure their pages rank when users search keywords related to their cause and geographic locations in combination. In order to improve your local rankings, Community Boost recommends creating a Google+ profile and filling out the about section to give Google an idea of who you are and what you do. After you create your profile, your organization will appear in the results when people search for your cause and location on the right hand side of the search results. 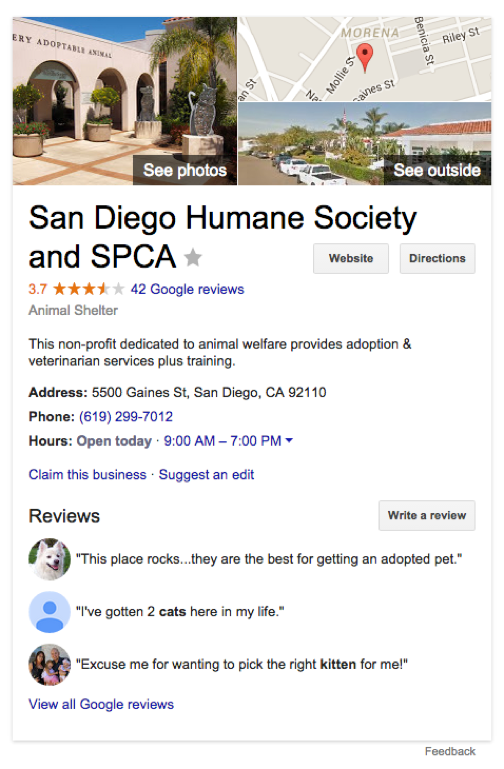 For example, a search for “San Diego Humane Society” resulted in the profile below. When you tackle this low hanging SEO fruit you give your pages the support they deserve. These tips are a great place to start but your overall SEO strategy should evolve and grow with your organization. Next steps might involve tracking your website’s performance with Google Analytics, or making website design changes to ensure your site is built with both the user and SEO in mind. Community Boost points out that, at the right time, a consultant can help nonprofits take their SEO strategy to the next level.